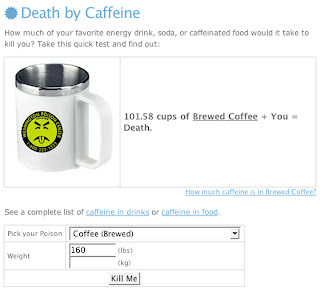 Death by caffeine: Are you an energy fiend? I like coffee. A lot. Still, I cut myself off at 90.58 cups. Did not take your test because I'm afraid to find out. The way I look at is that I'll feel like dying if I don't get coffee, especially in the morning, so that justifies my habit. And it tastes soooo good! Can I pass me some more salt?